The hotel was in a poor location it was cut off from any amenities. Food was very good a great choice of salads always very freshly prepared.Hotel and frontage in need of refurbishing looks tired and out of date. Hmm, I was so looking forward to staying at the Louis Creta Princess. I think that having stayed at the First Choice Holiday Village in Turkey last year, I was expecting more than we got and felt a bit let down. The hotel is clean enough. That much hits you in the face when you first walk in, but, on the whole it could do with a bit of a make over. We stayed in one of the bungalow rooms and we couldn't fault the location as we were on the ground floor facing the first of the pools and it was just a few steps to the water and the sunbeds. The rooms are quite small and basic and the beds are hard. But on the whole it was comfortable and all four of us coped with the size of the room. It made a change for the kids to sleep on decent beds of the own rather than sharing a fold out bed. The room was cleaned daily with fresh towels three times a week. The food was good, but a bit repetative. There was always a good selection to choose from that included a carvery, show cooking, salads and a kids buffet. However, the kids buffet always had spaghetti bolognese along with just one other choice. Breakfast consisted of sausges, bacon, fried/scrambled eggs and beans etc. There was several choices of cereal and bread, cooked meats and cheese. But my favourite was the pancakes with fruit and greek yoghurt. Lunch saw BBQ meat and salads or there was the Chinese and the pizzeria. Believe me, the pizzas are very tasty. The Louis Creta Princess really is in the middle of nowhere. There are a handful of bars and shops about 10 mins walk away or you can catch the bus into Platanias or Chania from right outside the hotel. The fare to Chania for an adult is 2.70 Euros and you can either pay on the bus or buy your tickets from the shop in the hotel. BUT, be warned, the drivers and conductors are very rude, angry and abrubt. One poor sole was told quite bluntly to chuck her Ice Cream away or catch the next bus. Oh, and the hotel beach is awful. It's totally unsafe for small kids as the waves can be very rough. It's a shame as it is one of the few things that spoilt this holiday as the hotel staff are not the friendliest I've encountered either, especially in the restaurant. There are no smiling faces and if you dare to sit at the wrong table, you are chased away. On a couple of ocassions, when dishing up some food on to my plate, one of the kitchen staff literally took it away from me in order to top it up with fresh food which I found quite rude. Oh, and don't try to ask the old bloke in the pool bar for a tray as a blunt "no" and a filthy look will come your way. The entertainment left a lot to be desired. It kicked off at 8.30 with the First Choice party dances for the kids before the hotel animation staff took over the party dances and played almost the same songs again! The "Show" didn't start until 9.45 and was over by 10.30 and believe me, you were left feeling unwelcome there as the bar was closed at that time as well. Apparently, the head of the Animation team walked out at the start of the season and left the others high and dry and not really knowing what they are doing. I personally don't class a 45 minute bingo game as entertainment and over two weeks we were really bored. We ended up sitting on the grass outside having been to the local supermarket to buy some beers as the beer the hotel served up is awful. Plus it was only 2%! Now, I'm not one for getting sloshed every night, but I like to know I have had a drink. This beer was like water and the Vodka and Whiskey is no better to be honest. The size of the flimsey plastic cup is a joke as it's the same size you would give out at a kids party. The animation team do a better job during the day with something going on all the time. The best day is Sunday as they do their verion of the Olympics. Everyone is split into two teams and compete all day in fun games. There was a great atmosphere and in my mind maybe they showed do it more often as it really got the guests involved. All in all, it was a well needed break in the sun, but I would not go back to the Louis Creta Princess unless they did something about the entertainment, put alcohol in the drinks and replaced the staff. Hotel clean but needs a referb looks grubby. food was good plenty to pick from different theme nights. hotel in middle of nowere a few shops about 10 mins away shop on site very expencive.you can get a bus into charnia for 2euros 10 cents each way but be warned to drivers and conductors are very rude as are most people on crete.as far as the hotel staff we found some ok but the bar staff are very rude and not to helpful.the entertainment staff try hard but things need to get a lot better there is always something going on in the day but the evenings are poor sunday is the best day you join in with the olympics in the day and the comady show is worth a look. all in all we enjoyed it glad we went with other members of the family or we would have been boared stupid. When we first arrived at the hotel,as we pulled up, there was a large amount of letters missing from the wall which was supposed to read Louis Creta Princess. So straight away, this created a bad first impression for me. When we entered reception, at a glance, it seemed to be good, looked clean enough, but being in a bit of a rush, I didn't really absorb the surroundings in the foyet. We promptly made our way to the room. We stayed in a bungalow room and it was one of the last ones in the far building, so we were right near the sea, so the view was kind of nice. When we entered the room, we were taken aback by it's size. But reassured ourselves that that didn't really matter. What was more strange, were the 2 doors that connected us to the 2 rooms either side! Which at one point, at 1 o clock in the morning, some newbies were trying to get through! The room wasn't exceptionally clean, it looked as though maybe the maid did a quick tidy up rather than cleaning. The food in the first week, I quite enjoyed, lots to choose from, after the first week, It was kind of the case 'been there, done that' and found it a bit of a bore. The snack bar was ok, served it's purpose. The Chinese I found a bit basic and tried my best to give it a go, but again, not much variety. Finally, the 'entertainment'. It was drab. Kids club started about half 8, promptly followed by mini disco time - Same Songs! I practically knew all the moves after 2 nights. After all the kids stuff had finnaly finsihed, the stuff that followed didn't impress much. The stuff that involved the crowd was ok, you can't really go wrong with that, but the actual shows were poor. The 'entertainers' would come on, do a 3 minute number, then disapper for 5 minutes, until the next 3 minute number. And the bingo! I didn't like it before, and that only served to deepen my dislike. It wasn't all bad though, the pool area was nice, which is where we spent most of the time and I found that most of the staff were nice enough if you gave them the time of day, instead of just barking orders at them. There were plenty of sunbeds and the general upkeep of the actual grounds was well done, grass cut regularly and the foliage that had fallen was picked up every morning. Also the pool was cleaned out every morning. This is the first time I've been to Greece or a Greek island, so I can't compare to other Greek places. But the places I have been impressed me more in all aspects. Maybe that's the quintessential Greek hotel. visited this hotel for the first 2 weeks of july, and had a fantastic time. rooms very clean and despite previous reports ok in size (2 adults and 2 children in ours), balcony is small though. food excellent pizza is a must, didnt think much to the chinese though, but many people used it. pools fantastic ,beach nice for photos but not suitable for kids. the animation team are great if you get involved (a big thanks to you all especially alex and stephanie)found the hotel staff not as nice as some greek staff probably due to the all inclusive which brings me to a couple of bad points. i have just got back from the louis creta and had a wonderful time,the all inclusive was great,the hotel was always kept to a great standard,with the rooms being cleaned daily. the hotel food was really nice with greek meals, the pizza place near the pool was really nice too,but the chinese i thought was not very nice i tried it on 4 occassions and didnt enjoy it at all.the hotel is quite far away from chania but is a fantastic resort for families,the staff were very polite and willing to help on any occassion.a big thanks to annimation team who try their best all day long, but the entertainment at night isnt to good but they do work hard from 10am- the early hours. (so thank geovanni,alex and the girls. )the first choice kids clubs were great all 4 of my girls went in and loved it, so a massive thanks to tracy,lauren,sarah and heather.we enjoyed it that much we would love to go back again.. The food at this hotel is excellent, as much as you want, and a great variety. The rooms are cleaned every day, with clean towels and bedding. The hotel grounds are maintained to a high standard, and located in a quiet resort, ideal for chilling out, and having a stroll along the beach. Hotel staff very friendly and pollite. 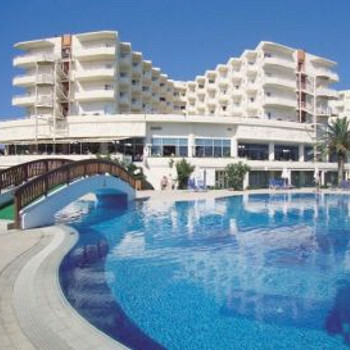 Plenty of sun beds and three very large pools. There is not much in the way of entertainment for adults but well catered for the kids. would go back to this hotel. all inclusive very good something for everyone.lowenbrau lager i think was about 1%proof as was the wine.self service soft drinks good but lots of wasps flying round it all day which put me off.bungalow rooms were cleaned everyday with fresh tools but they are pretty drab.food good pizza excellent chinese poor and they were closed two days of our weeks holiday without explanation.the hotel is in the middle of nowhere but pool area is as good as it gets.hotel staff friendly first choice kids club ok but was closed 2 days for trainingand they have sun off so that was 3 days no club.entertainment for kids good but for adults forget it.if you have kids youll enjoy it but on the whole i think its a bit pricey for what you get. Having just returned from 2 weeks at the Louis Princess Creta we can honestly say we had a great time. The rooms and hotel are kept very clean maid service every day for 14 days. The layout of the hotel is very good, the pools are great and the hotel is directly on the beach. We went in the 6 weeks holidays and got a sunbed every morning even at 10.30am. The food is good and is available all day, the pizzas at lunch time are a must. The self service drink systems works very well although watch out for the wasps. The animation team were good but unlike others we've seen they do mime. Saying that they work tirelessy all day every day. A great hotel for families, I would recommend this hotel but I would also recommend hiring a car. We have just returned from our second visit to the Creta Princess (last visit 2003). We are delighted to say that we have had the most fantastic time. The hotel and pools are spotless, the staff polite and friendly and the food smashing!! They have added the pizza and chinese bar since our last visit - yum yum!! We had no problems getting sunbeds, in fact it looks like they have many new ones as there were piles of empty beds stacked in one area. The entertainment was really good, we thoroughly enjoyed it. We had some lovely photos done by Marco, the photographer. My husband had a back massage from Diane and we booked the waterpark on the little blue train through the lady by the pool (sorry, I dont know her name but she was lovely and friendly!) The waterpark was a great day out and it was a nice trip on the train - I would reccommend it. All in all fantastic for a lovely family holiday!